A well-stocked pantry is something I always try to have regardless of what my schedule throws at me. Quick staples I usually have on hand include assorted grains, pasta, various canned beans and canned tuna. Well, I recently discovered a new go-to pantry item. It’s canned chicken breast from the brand Wild Planet. It is USDA-certified, organic free-range, Certified Humane Raised and Handled chicken breast that’s roasted without added water or fillers. 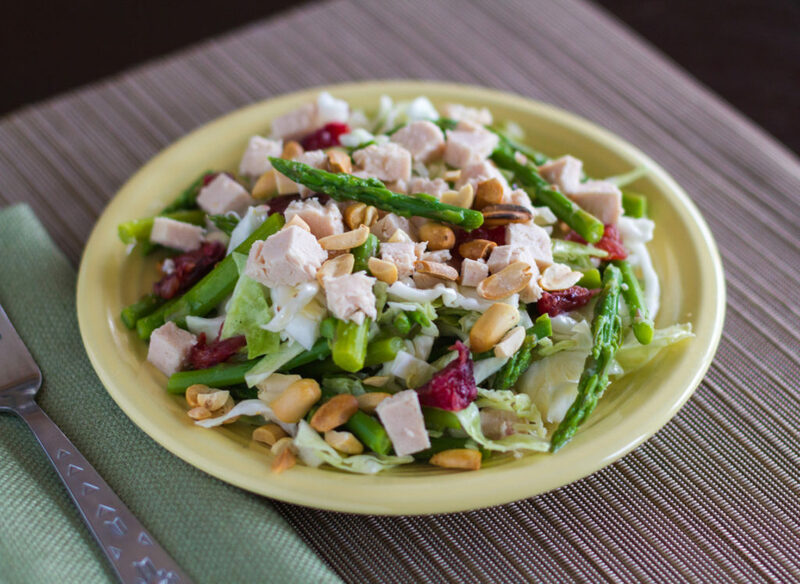 Paired with a few fresh springtime ingredients and an Asian-inspired dressing, this chicken salad is a great healthy, low-calorie, dinner or lunch. Using a fork, break up the canned chicken breast into a large bowl. Add the shredded cabbage. Rinse, trim and cut the asparagus into 2-inch pieces. Place the pieces into a pot of boiling water and cook for 1 minute. Drain and place into a large bowl of cold water. Pat dry and add to the chicken and cabbage. Trim the ends of the blood orange so it sits flat on a cutting board. Using a sharp knife cut away the peel and pith as close to the flesh as possible. Segment the orange from the membrane. Add the pieces to the chicken and vegetables. Add the scallion slices and season with salt and black pepper. Make the dressing. In a small bowl, whisk together the grated ginger, minced garlic, sesame oil, rice wine vinegar, maple syrup and sunflower oil. Pour over the salad. Toss to combine. Before eating, top each serving with a tablespoon of the peanuts.